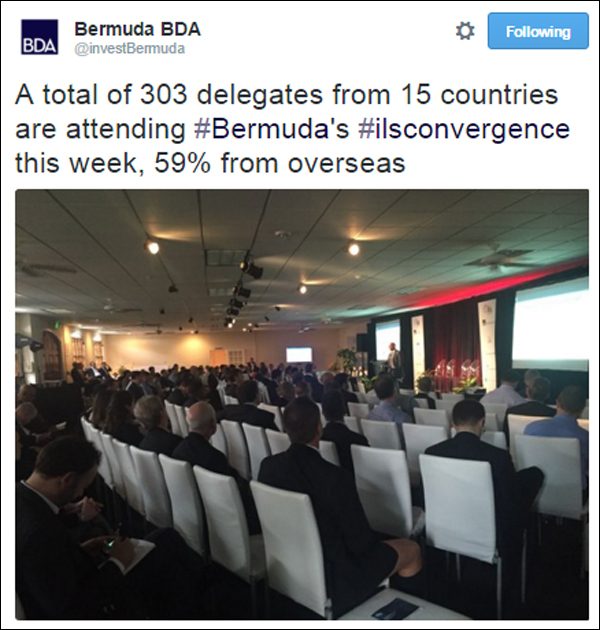 More than 300 attendees from 15 different countries arrived at Pier 6 in Hamilton for Bermuda Convergence 2015 this week, a networking event covering Insurance Linked Securities and alternative risk transfer. The event featured keynote speaker Jimmy Spithill from Oracle Team USA, and several panel sessions with key industry leaders were held, followed by an evening at the World Rugby Classic. New to this year’s networking event are “Bermuda Shorts” – brief 10-minute presentations where speakers share their recent research, a business idea, or an informed viewpoint. The rapid format provided attendees a brief overview on topics and ideas from thought leaders within the industry. The idea of anchoring Bermuda as a centre of excellence for the creation and listing of ILS structures and hosting an exclusive event in Bermuda was conceived by ILS Bermuda Ltd., which is comprised of industry executives. The event was supported by the Bermuda Business Development Agency [BDA] and local and overseas sponsors. Premier of Bermuda, Michael Dunkly commented, “Bermuda has a growing ILS market, which we believe will continue to evolve, providing not only catastrophe cover but also securitisation opportunities across the spectrum of insurance and reinsurance. Kathleen Faries, CEO of Tokio Solution Management and Deputy Chairman of ILS Bermuda organizing committee said, “The genesis of this event was to give key decision makers time to network and discuss ways to do business together, and there is no better place to do that than Bermuda – where risk can be sourced, managed, structured and valued. Proceeds from the sponsorship of Keynote speaker, Jimmy Spithill are being donated to the Endeavour Program, a Community Sailing Project directed by The America’s Cup with some of the biggest names in the marine industry taking a leadership role. The three main pillars to the Endeavour Program include a cross-curricular education program, youth sailing and College Sailing internships with Oracle Team USA. The program focuses on Science, Technology, Engineering, Arts and Math. Initial feedback from delegates and sponsors indicates Convergence 2015 was a tremendous success. Expectations were exceeded on the number of delegates with 59% of delegates coming from overseas including from Australia, Canada, Cayman, Colombia, Italy, France, Germany, Hong Kong, Japan, Monaco, Switzerland, the United Kingdom and the USA. The next Convergence event dates will be announced in due course. whatever happened to the black mayor’s conferance btw? It already happened. How did you miss it?